Universities from Poland and the United States began this year for the first time academic collaboration with the Higher Education Center in Holguín, in northern eastern Cuba. Francisco López, methodologist for the attention of international projects in Holguin house of higher learning, said that every university needs to show its scientific results and this is only achieved through the exchange of experiences. He emphasized the interest of the professors and students of the Technological University of Bialystok, Poland, with the collaboration agreement, since to date they had circumscribed their working relationships only to European nations. Expectations include joint realization of an internationalization project, which will not only take into account the importance of academic exchange for the scientific exercise, but also working on the creation of tools and strategies to enhance it. When referring to agreements established with institutions, primarily from the state of Ohio in the United States, the professor stated that the thematic axis will be related to the teaching-learning process of English language. López also pointed out the permanence in the current period of the projects of creation of a bi-national network of studies of participation and social inclusion with the University of Brasilia and another one related to biodiversity preservation at Cauto River Basin through Agro-ecological practices involving representatives of the United Nations Development Programme. 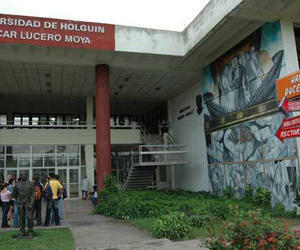 The University of Holguín has more than 80 agreements with institutions from 17 countries and belongs since March 2014 to the Ibero-American Association of Postgraduate Universities (AUIP by its Spanish acronym) and the Latin American Research Network of organizational competitiveness.